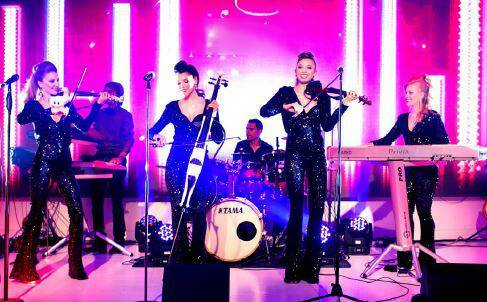 Amadeus is an entertaining, highly skilled and versatile electric string quartet from Romania, available to hire for corporate parties, balls, product launch parties, film premieres, anniversaries and weddings. These corporate entertainers will leave your guests amazed with their exceptional skills and vocal talent. Amadeus has managed to break patterns in 2000 and become one of the most original bands in Europe. The fresh musical style, the virtuosity and the energy on stage earned the band a fast growing fan base, hundreds of concerts all over the world and 6 albums with original music sold out in the 15 years since the band’s formation. You can easily find the fact that Amadeus is the most popular electric string quartet online (on Facebook and on YouTube), with over 60 thousand active fans on Facebook and more than 10 million hits from all over the world on their music videos on YouTube. They also have weekly appearances in magazines, online magazines and written newspapers or TV shows. Alonfg with a stunning and beautiful appearance, Andreea (violin & lead vocal), Naomi (keyboards), Bianca (violin) and Patricia (cello) are all academically classically trained. They all started to study instruments from the age of 6 at the best schools of music in Romania – “George Enesco” High school and after that at the National University of Music, Bucharest. Because their “top-model” looks, their awareness and big media exposure, a lot of brands, fashion and jewellery designers choose to associate their brand with Amadeus. One of the violinists, Bianca, is also the winner of Top Model Romania in 2012 and is also a professional fashion model. Thanks to their wide ranging repertoire, Amadeus has a great advantage over other similar acts. In all these years, they have gathered over 60 original songs written for their album records and over 100 of the most beautiful famous classical and movie themes, evergreen songs, world music, pop hits and Romanian and Balkan themes. All the songs have very good quality backing tracks. Amadeus have their own recording studio, with a professional team of musicians and they are open to compose new original songs or something specially suited for you (i.e. a local hit or a local traditional song, etc.) or something to go with your event theme. Also they are very open to developing new artistic concepts, for example, but not limited to a collaboration with a local artist/band, introducing high-tech in their show, big screen personalised projections, etc. Team work is very important, as is a good understanding of the environment and objectives of a particular event or contract. For these reasons, it comes as no surprise that Amadeus successfully attended many festivals and corporate events all over the world. Emotion and professionalism brought together. The events that Amadeus are usually performing at are very different and unique: they can perform in shows on big stages with visuals on LED screens, lighting effects, dancers, etc., or you can be amazed by Amadeus at private small or big parties and weddings, where they play instruments and sing international hits in their style and evergreen classics for people to dance to. All Amadeus stage performances are choreographed, and they have different costumes to suit the event atmosphere and the music they play – from classy look to sparkling parties. Amadeus have custom videos for all their repertoire, therefore they are able to make a complete visual show as well, of course if technical specifications are met by the event location. They are quite flexible, adapting to different types of audience. Amadeus are able to put a lot of virtuosity and energy in their shows, from classical music having a modern touch – for the events where people just need to enjoy a show, to fully electrized atmosphere party shows – where guests enjoy dancing all night long. 1. Amadeus Electric Quartet (instrumental with backing tracks) – choreographed show from 20 minutes to 60 minutes, fractionated in 20 or 30 minutes sets with costume changing. 2. Amadeus Band (vocal/ instrumental, with extended team) – maybe the most elegant cover band you ever seen. From 30 minutes to 120 minutes (3 x 40) fractionated in maximum 40 minutes sets. Amadeus can mix the two shows in the same evening, a very good choice for corporate or private events : 20 minutes Electric Quartet Show (instrumental) + 1 or 2 sets x 40 minutes Amadeus Band Show (vocal/instrumental). No matter whether it’s a public square, a stadium, a concert hall, an international music festival, a ball, a corporate or a private event, Amadeus will capture the audience’s heart with their music, look and charisma, entertaining and engaging the crowd. They are not only receptive to bold ideas, but their enthusiasm and joyful approach to music and spectacle is perfectly complemented by a rigorous attitude towards business and performance. Naomi Anelis – piano / keyboard.